After his 312 day struggle on the Pacific, Erden Eruç returned to Seattle on June 13th 2008 to wait out the typhoon season. By then, he had been separated from his wife Nancy for almost a year. There was a lot of catching up to do. Erden tried to spend time with friends as their mutual schedules allowed. He sent friends emails or left phone messages asking to get together. He also left a message for Emil Kossev, who had advised Erden as his rowing coach at the Pocock Rowing Center (PRC). Knowing that he would have to row across oceans during his human powered circumnavigation, Erden had become a regular at the PRC begining in the year 2000. He was aware of the elite rowing program at the PRC which Emil had started. Emil was an experienced coach, supervising Olympic caliber rowers. Emil had seen many hopefuls come and go, and he had the uncanny ability to see past the façade. When Erden shared his plans with Emil, he commented: "You are crazy. I will help you." From then on, Emil kept an eye on him during Erden's visits to the PRC, providing Erden with valuable pointers on the rowing ergometer and on the water. He could see me row up and down the water from the clubhouse, and on occasion he would come out to pace Erden on a skiff, calling out corrections to his rowing technique. Erden already understood the training principles from his years of involvement in sports at a competitive level. Emil's rowing specific instructions helped Erden gain more confidence in his abilities over time until Erden felt ready to take on the oceans. Then Erden got the news that Emil had passed away on September 15th. Could he have seen Emil once more had he been more persistent since his return to Seattle? It was easy to second guess one's self in such situations, yet the message was clear: there is no better time than today to call up friends and family, and to tell them why they are important in our lives. Below is the obituary written for Emil. Please note the invitation to support The George Pocock Rowing Foundation - Kossev Endowment which would help to support aspiring rowing coaches who would emulate Emil's example. The Seattle rowing community mourns the passing of one of its brightest stars. Emil Kossev died peacefully on Monday September 15, 2008. Fighting until the end, he lost his battle with Clear Cell Sarcoma, a rare form of bone cancer. Born in Gabrovo, Bulgaria and a graduate of the Bulgaria's National Sports Academy in Sofia, Emil pursued a life in the sport of rowing. He was a four-time Bulgarian national team member and won thirteen Bulgarian national sculling titles between 1982 and 1991. He was a recipient of Bulgaria's Master of the Sport Award in Rowing, granted for lifetime accomplishments in the sport. Although he was an accomplished athlete, it was as a coach that Emil would make his mark in the sport. In 1992 Emil traveled to the United States to pursue a career in coaching. After initially settling in Everett, WA he moved to Seattle, WA and founded a High Performance training program at the Pocock Rowing Center. Starting with a handful of dedicated athletes Emil built a modern-day, high performance training program that integrated his unique performance technology expertise, rigorous physiological training and high quality technical instruction. He coached twenty- eight crews to medals in elite international competition including a bronze at the 2004 World Championships, two silver and two bronze medals at the 2003 Pan American Games and gold in the men's single sculls at the 2000 Olympic Qualification Regatta and gold in the men's single sculls at the 2000 Slovakian Olympic Trials. His athletes also placed first in the men's single sculls at the 2004 U.S. Olympic Trials and women's single sculls at the 2000 U.S. Olympic Trials. In 2005, Emil was nominated for the prestigious United States Olympic Committee's "Doc" Counsilman Science Award in recognition of his practical application of sport science and technical video analysis in the training of high- performance rowers. In 2007 Emil made a decision to leave day-to-day coaching. Although he never severed his ties with the Pocock program, he took the position of Performance Technology Advisor with Podium Canada in their Road To Excellence initiative. He was responsible for providing mentoring support to Canada's targeted summer sports as part of their preparations for the 2008 Olympic Games. He also played a role in educating technical staff in the areas of applied high performance technology and advanced video systems. 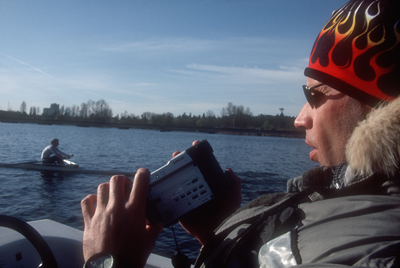 In his commitment to rowing, performance technology, and research-based training, Emil changed the landscape of rowing in the Northwest. With all of his success he remained humble and continually strove to find ways to integrate and apply technological tools to enhance performance and increase speed. Emil's life was not always about coaching elite athletes. He had a profound influence on athletes of all ages and abilities. He was an advocate and coach for numerous masters scullers. As his career progressed he became a mentor for other coaches in the community, building on the long traditions of the sport's success in the Northwest. In his short time he made so many friends across North America. He was loyal and generous; he never returned from trips without gifts. From T-shirts and hats to pens and snow-globes he always found a fun memento to brighten your day. He always made time for coffee dates. He had the ability to be sensitive when an a friend or athlete needed someone to listen and conversely knew exactly "how and when to turn a whiner to the mirror to move on with it." He made many stronger mentally and physically because he believed in them even when they may not have, one of the greatest gifts a coach could employ. Emil was inspiring, creative and fun loving and he will be missed greatly. His friends will continue to treasure his memory and his impact on sculling in the region and throughout the United States will be felt for generations. In memory of Emil donations may be made to The George Pocock Rowing Foundation - Kossev Endowment, 3320 Fuhrman Avenue E., Seattle, WA 98102. The Foundation has established this endowment to honor Emil's legacy as a visionary and coach. In a world where it is acceptable to pass cynicism as critical thinking, Frank stood out as a bright light. He was a person with the ability to see the potential in individuals and to act on that promise. Soon after the death of Göran Kropp, Erden attended a presentation by Carlos Buhler, an accomplished climber himself. In attendance were Frank Olding and the founder of Outdoor Research, Ron Gregg, who ironically died a couple months later in an avalanche while back country skiing in British Columbia. It was during this brief first encounter that Frank became interested in Erden's project. Erden had ideas and dreams which needed structure to realize. Incorporating and bringing a sense of order into the huge undertaking required expertise. "I like helping climbers," said Frank and called a meeting with his friend Christopher Beer to discuss the appropriate business solutions. Chris has been a central influence on Around-n-Over and how we do business since that day. For Erden, Frank was the one to put him on the right track, and for Around-n-Over, he was the enabler. We will miss him. Below is the obituary written for Frank. Please note the request by the family to donate to Room to Read which would help to realize one of Frank's dreams. Francis X. Olding, devoted husband, Army Ranger, Seattle lawyer, and avid climber and outdoorsman has parted company with us to climb peaks unseen. Frank Olding, born on April 23, 1964, in Cincinnati, Ohio, to Paul and Anna May Olding passed on September 6, 2004 while climbing at Grand Teton National Park, Wyoming. In addition to his adoring wife and loving parents, Frank leaves behind three brothers and three sisters, and numerous nieces and nephews. Prior to moving to Seattle in 1997, Frank served with distinction in the United States Army. As an Airborne Ranger, Frank graduated from Ohio State University in 1992, where he received a Bachelors degree in Political Science. After attaining his undergraduate degree, Frank obtained a Law Degree from the University of Toledo, Ohio. In 1997, Frank moved to Seattle to pursue his dreams, including the practice of law and all things outdoors. In 1999, Frank had the good fortune of meeting, falling in love and, in August 2001, marrying his wife beloved Teresa Olding. Frank and Teresa celebrated their marriage by climbing Mt. Kilimanjaro, elevation 19,340’, in Africa for their honeymoon. Frank was a charismatic, compelling person who touched everyone that had the opportunity to meet him. His love of the outdoors was infectious and he always sought companionship for every adventure that called to his great heart. Although possessed of an uncompromising adventurous spirit, he was happiest when in the company of family and friends, whether lifelong or newly made. Frank enjoyed sharing his passion for the mountains with people of all abilities and skill levels. His enthusiasm was tempered with patience while introducing the sport to family and friends. He took frequent trips to the Cascades and Tetons. He also traveled and climbed in Peru, Ecuador, Mexico and Africa. To have spent any time in his company was simply to know the delight of life. Although we are joyful that Frank’s spirit must now soar above the peaks that so called to him and he is onto another great adventure, we all mourn his passing. His will be greatly, greatly missed. In June 2004, after a successful career with the Seattle law firms of Lee Smart Cook Martin & Patterson and Betts Patterson Mines, Frank established the Law Offices of Francis X. Olding. Frank and Teresa had dreamed of building a school in Nepal for underprivileged children. Please send any donation to Room to Read, a group dedicated to providing reading materials to underprivileged children in Nepal. Send check, made payable to Room to Read, and In Honor of Frank and Teresa Olding, at: The Presidio, PO Box 29127, San Francisco, CA 94129. It had been a long time in brewing. Erden had this idea that he could go around the northern hemisphere by human power. As he shared this idea with others beginning in 1997, Erden discovered that he had to carefully nurture and guard his dream for it to reach maturity. In disbelief, many were asking "so, have you done such a thing before?" Not Göran Kropp. His questions were affirming: "When are you leaving?" he asked when they first met in the summer of 2001, "do you have any sponsors?" As a man who had accomplished so much at such a young age, he was humble, he showed great curiosity in others and had the gift to make the conversation about the other person. "Maybe we will kayak the Siberian shores together," he added showing a kindred spirit. Göran was best known for his unprecedented bicycle trip from Stockholm, Sweden to Nepal in 1996. He had a statement to make. Motorized help, using porters, and using supplemental oxygen all served to bring the mountain to the level of the climbers and this was cheating. Outrageous amount of supplies to support the large number of people on many teams seemed to take away from the magic of climbing Everest. He wanted to change that. He was going to climb Everest solo without supplemental oxygen - the catch was that he was going to tow all of his climbing gear with him on a trailer. He left from Stockholm, Sweden, to travel through the rest of Europe, Turkey, Iran, Pakistan and India, covering thousands of miles to reach Nepal. He then loaded on his back over 200 lbs of gear and supplies that were with him, eventually double carrying them all the way to base camp. Only then was he in position to actually start his climbing. That 1996 season on Everest proved to be a fateful one as was described in Into Thin Air by Jon Krakauer. Many climbers including very experienced international mountain guides were caught near the summit by a storm, unable to descend to safety. In the midst of this calamity, Göran was able to judge the conditions correctly, returning from within reach of the summit once, and to succeed in a later try. While in Nepal, he was working with Wongchu Sherpa to arrange the logistics of his growing business, Kropp Aventyr. They collaborated to support a school in Wongchu Sherpa's village. The Bishwa Darshan Primary School in Taptin, Chyangba, Solukhumbu, Nepal now serves 165 pupils and eight teachers. Göran had started climbing with his father. At the age of six they scaled Galdhøppigen together, the highest peak in Norway. While in the Swedish army, Göran met Mats Dahlin, another young soldier who loved climbing, and together they rekindled their enthusiasm for the mountains. As they were training in the Alps for their upcoming Cho Oyu climb, a stray rock fell from above, taking the life of Mats. Göran carried on with their plans, planting the ice axe of Mats on the summit of Cho Oyu six months later in 1992. In 1993, he became the first Swede to climb K2. He left the army and joined the talk circuit, giving entertaining presentations to diverse audiences. He moved to Seattle after receiving hostile press in Sweden for shooting down a stalking polar bear during his 2000 attempt to reach the North Pole with Ola Skinnarmo. Göran fell to his death while rock climbing in the Frenchman Coulee near Vantage, Washington. Tragically, Erden was his belayer and the first responder after his fall. At the time, Göran was planning an all human powered circumnavigation of the continental USA. He and his fiancée Renata were going to kayak south along the western shores of US, then carry their folding kayak on their backs over the mountains into the Rio Grande to reach the Gulf of Mexico. The journey was going to trace the remaining US shores in a counter clockwise direction. Great Lakes and river systems along the Canadian border were going to bring them back to Seattle. Göran was only 35 years old when he died, leaving us to wonder what other fine journeys he could have realized. 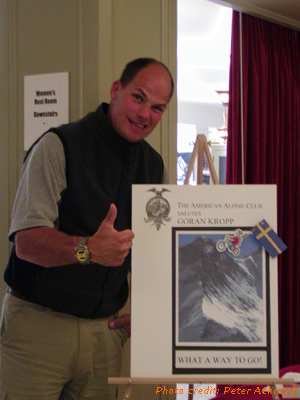 A double thumbs-up was Göran's trademark and, while pacing energetically across the stage during his presentations, he would say half laughing in his characteristic good humor: "Kropp on top!" Where he lays now is inside the stone walls that surround the yard of the church where his grandfather used to preach. There is a patch of flowers that blanket him, and a budding young oak tree is reaching for the sky in their midst.